One of the most significant opportunities for administrative improvement in our choruses would be to have a set of best practices that were part of the chorus’ culture and survived transitions in chorus leadership. They would support the stability and long-term sustainability of our member choruses which has been identified as a major weakness through the consulting work of our 411 advisors. We have developed a set of best practices that are considered hallmarks of a well-managed non-profit organization and are achievable by any size chorus. Member choruses are encouraged to review the best practices list and consider applying for designation as a member of the best practices group. Membership benefits include the right to display the best practices logo on your web site and to cite this accomplishment in fundraising documents such as grant applications and also provide one free delegate registration to the GALA Leadership Symposium annually. Contact executivedirector [at] galachoruses.org with any questions on how to join the best practices program. 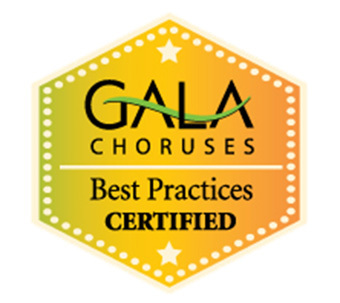 Congratulations to the choruses who have achieved Best Practices certification! "An important consideration in grantmaking is the sustainability of the organization applying for support. With our funding, knowing that a constituent's board is taking the steps necessary to ensure their long-term health and survival is vital. Certifications like GALA’s Best Practices Program convey that the applicant takes governance seriously and is in investing in their future."